Discover the Causes and Affects of Major Avian Diseases and Conditions. Helping to conserve endangered birds (especially cockatoos and parrots) indigenous to Indonesia. Helping to provide sustainable income to local villagers—that is, promoting ecotourism and agricultural development—at the sites where these native birds reside (which in turn will help to reduce the villagers' need to trap the birds as a source of income). Improving the welfare of Indonesian parrots (especially cockatoos) in captivity. Serving as a source of information and education concerning the first three goals. 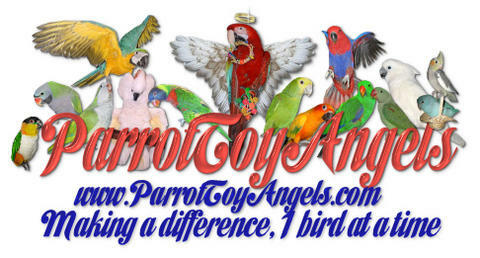 Do you have a healthy, socialized bird that needs a new home? Please read "Tips on finding your bird a new home." Here at Mickaboo we wish that we could take in all of the needy birds out there and find good, quality homes for them all. However, the truth of the matter is that there are far too many birds needing homes and far too few good homes to be found. We must rely on the owners of healthy and well adjusted birds to find their own adopters so that we can focus on and keep resources open for the birds who really need us; the ill, injured, abused and special needs birds. It is important to know that finding a quality home can take time and there is some detective work involved. There is no "perfect home" and you may find that you go through quite a few "toads" before you find your "prince". It will take some work but will be very much worth it to know that the pet you love is in a loving and responsible permanent home. ... or "Everything You Never Wanted To Know About Cockatoos!" Very honest and realistic description of what it is like to live with a Cockatoo and why so many end up in rescue. Anyone thinking of getting a Mollie should visit this site first. The Oasis Sanctuary is a life-care facility for captive Exotic birds. In particular they are a refuge for parrots, cockatoos, macaws and other Psittacine birds; although they do accept Passerines (finches and canaries) columbiformes (doves and "fancy" or racing pigeons) and other captive avian species. As a true sanctuary, they do not offer birds for adoption, however they work with and refer birds requiring re-homing to bona fide adoption programs around the country. Copyright © 2009-2015 Mollywood Avian Sanctuary. All rights reserved.